Yesterday afternoon Dan and I left Raven at home and headed over to the park to do some hiking. That morning he’d had a meeting with the park superintendent about the research he intends to do there. His research permits have now been approved, so he has the green light to go ahead with his work inside the park boundaries. With the application for permits for research on the nearby crown land also approved, all that remains left to do is line up funding. He’s already received a portion, his outstanding applications look promising, and he’s received great support from the local community and feels any remaining balance can be made up through fundraising efforts. Things are looking good. You can follow along with the latest observations, survey results, and various administrative updates at the Frontenac Bird Studies blog. Following his meeting, Dan came home and started scrutinizing a map of the park, looking for possible areas to place his study site. There are several tiers to the project, but the one I have the most involvement in, and the one that requires a set location, is MAPS – Monitoring Avian Productivity and Survivorship. It is a banding program that allows you to determine the population statistics of the birds of a region. It’s more than just censusing your local patch – because birds wander after the young fledge, in post-breeding and post-fledging dispersal, the data collected from MAPS provides information for as much as 12,000 hectares of the surrounding landscape. The data tell you things like how many males and females are in the population, how many are first-time parents or experienced birds, and general recruitment numbers (birth rates), as well as survivorship (death rates) through birds recaptured in following years, since birds usually return to the same general area year after year. These are important figures because they can help to pinpoint causes of population declines (or booms, should the birds be so lucky). Monitoring programs such as the Breeding Bird Survey can simply tell you the whos and whats. It’s the MAPS program that helps to tell you the whys. The banding, of course, requires that you have a set location where you can set up mistnets with which to catch the birds. For nets to be most effective you really need to place them in mid-story vegetation, either scrubby bushes or second-growth, or dense evergreen or forest understory. 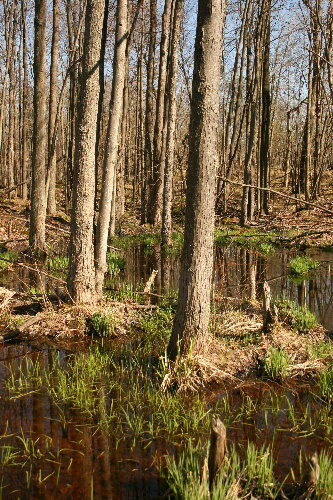 This sort of habitat not only encourages birds to move around lower (at net height) as they’re foraging, but also conceals the net from view. A net sitting out in the open is easily seen by birds, and they usually avoid it. It’s difficult to assess habitat from aerial photographs, though; although you can sometimes get a sense of general landscape features, usually it requires an actual site visit to determine the actual habitat structure. In the case of the park, there isn’t even high-res satellite photos, so all we really have to go by is the park maps. We’d like to site the MAPS station sufficiently far from public trails to not have to worry about anybody blundering in to a net, or coming across a captured bird and trying to help (usually their good intentions just make the situation worse, because they’re unfamiliar with how to safely use a net, and while banding is generally a safe practice, often injuries can result from untrained hands). So to avoid any risk of that, we were looking for interior sites that would still be relatively easy to access and hike through. We spent considerably longer out hiking than I’d planned, but we got to hike through a section of the park I hadn’t visited before. We were looking for an area of scrubby, semi-open habitat, where the size of trees was limited by a thin layer of soil, the result of two waves of fires early last century that burned through following the clearcutting of the land, leaving the empty landscape prone to erosion. 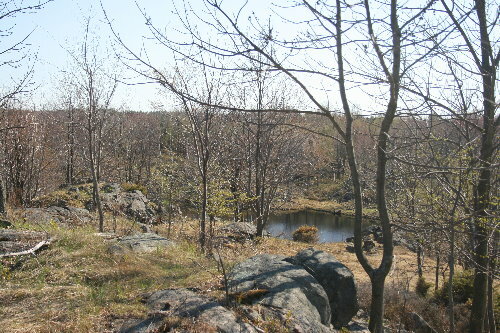 We didn’t find what we were looking for – I think we’d have to go a bit further east for that – but we did hike through some younger and more rocky forest than what’s around our house. 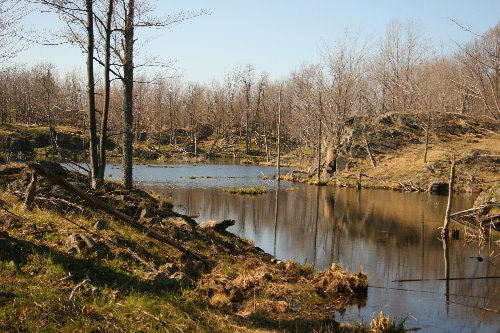 The habitat in that area is still more open than the mature forest surrounding our lake, with a lot of granite outcrops and grassy oak savannahs. 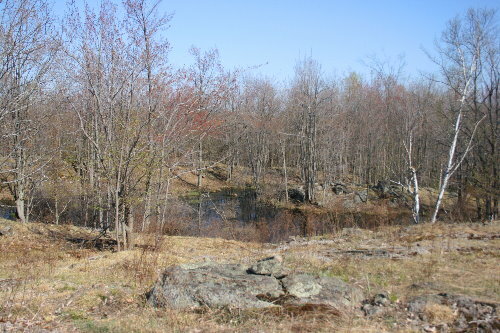 Quite a number of small vernal pools and little wetlands scattered across the area, too. Unfortunately, there doesn’t seem to be a strong mid-story component to the habitat, at least through that region, and we had trouble identifying any areas that would be suitable for banding activities. Which was a bit of a shame, because we were intrigued by the birdlife possibilities in that habitat, very different from what we’ve seen elsewhere in the region. We’ll have to keep looking. Still, it was a really enjoyable afternoon, and an interesting change of scenery from our usual destinations. We have hiked most of the park so if you want some opinions we would be happy to tell you what we know. Thanks, Barb. We need 8 hectares with enough dense-ish vegetation under 2 m tall to fit 10 nets spread 50-75 meters from one another. Any suggestions? :) Could follow up on the question tomorrow. Thanks, Russ. We had a lot of trouble finding crown land information for this area. There is a website that displays crown land and other holdings, but seems to mostly just have data for central Ontario right now. We ended up getting an old photocopied map from the superintendent at the provincial park when Dan was there discussing the project with them. I think you’d probably have to go through MNR to see. Around our area, even large expanses of land that have no roads or buildings and appear to be unoccupied are actually privately owned (at least according to the map we have), and presumably used (if they’re used at all) for hunting or recreation, or sustainably managed for firewood. The landscape looks gorgeous – a great place to have a study site with or without birds!